Tap: Creatures you control gain protection from the colors of target permanent you control until end of turn. You need some cards that can give you, in one turn, enough traction for an alpha strike. Ankle Shanker is a particularly scary example. Driven / Despair, Dominaria's Judgment, Overwhelming Stampede, Ready / Willing, Rush of Battle for that aforementioned life gain, Samite Elder targeting Saskia, Spare from Evil assuming there's no human tribal in the meta, Vault of the Archangel, Overrun, are all super good group buffs. So royku I run a less-competitive kaalia deck based on your budget one. Some cards to consider. Torment of Hailfire, Samite Elder, Whispersilk Cloak. I know you have the latter two in the sideboard, but they are huge pluses. superhuman21 on Kaalia Strikes Back! The deck is looking pretty good. You got the master of cruelties + strionic resonator in there already which is huge. The question I'd ask you though is what do you want to focus on? Angels + Dragons, Angels + Demons, or Dragons and Demons? While you can splash a couple of each into the deck I've found Kaalia plays better if you focus on two tribes. (I myself do dragons/angels). 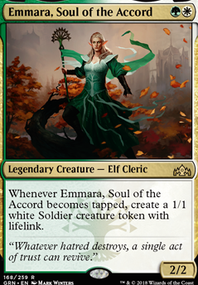 Emeria Shepherd Great for bringing creatures back from graveyard since you're mono white. Exquisite Archangel, Platinum Angel, Gisela, Blade of Goldnight, and Samite Elder All are great in Kaalia decks. 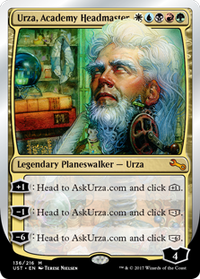 The deck right now is perfectly servicable as a R/W midrange archetype, but I get the impression it doesn't really know what it wants to be yet. 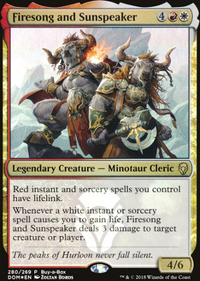 In adding cards like Boros Reckoner and Spitemare, you've created more payoff when Avacyn transforms from white to red, but those guys seem rather lackluster when you have Light of Sanction or Mark of Asylum on the battlefield. I'd either go further into the "protect all my guys from global damage"-theme and remove the punisher cards or alternatively you could maybe embrace the fact that your creatures will get damaged, in which case you'd want to cut cards like Repercussion. As it is, I feel there are a couple of boardstates where the deck might be it's own worst enemy. 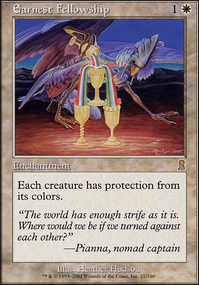 Either way, you could use some more non-angel creatures you can sacrifice at will or alternatively some more reliable token producers, possibly in the manabase (Kjeldoran Outpost and Kher Keep seem like good options to me). There are a couple of cards I don't really see much use for regardless of the theme of the deck. Those include Braid of Fire and Flickerform. 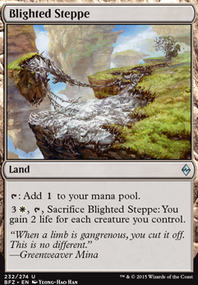 I can't see any mana sinks to use the mana provided by Braid of Fire during upkeep. Keep in mind that mana pools empty between turn phases. While I can guess that Flickerform is supposed to be used as a reset button for Avacyn, I'd wager that it's not necessary to flip her back this often. Maybe just play a simple instant speed flicker effect or two if you feel it's important for the deck strategy. Since most of your creatures have flying and likely won't lose in 1v1 combat, I'd maybe think about playing some sweepers that only hit grounded creatures like Molten Disaster or Fault Line. How about Witch-Maw Nephilim, along with the rest of it's four-color bretheren? 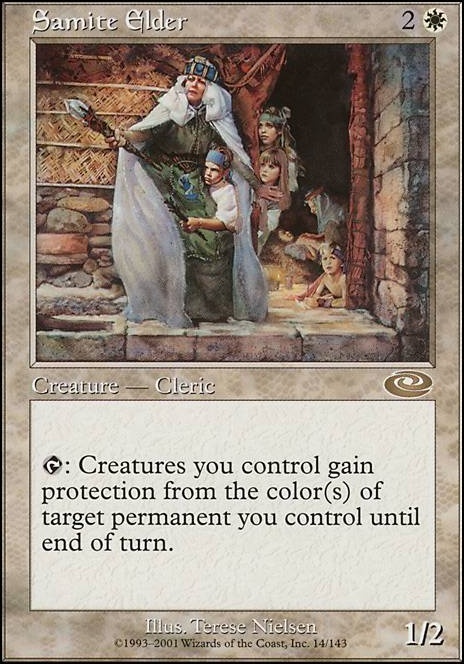 I'd want a few more four- or five-color creatures in the deck to full capitalize on all those lieges. Samite Elder, Earnest Fellowship, Civic Saber and Blessing of the Nephilim also seem thematically appropriate. Parallax Wave - Keep resetting the fading and using up to 4 of the counters each turn to remove blockers, protect your creatures and/or threaten anyone who dares attack you. Might be the one of the best cards with Brago in multiplayer. Something to protect all your creatures (like hexproof or persist which works well with Brago)? Any way to make Glory work? I'm just spit balling here. Anything I can think of that will protect Karlov and allow him to hit opponents or offer protection I'm just listing out. Whispersilk Cloak: evasion and shroud. 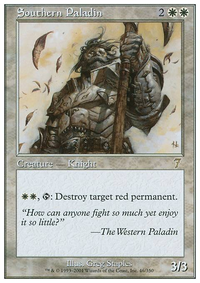 Righteous War: pro white and black for all my creatures. May be no bueno with the deck however. Samite Elder: pro white and black. Avoids a fair bit of removal. Akroma's Memorial: protection, evasion, and a little bit of everything. Pledge of Loyalty: pro white and black to a creature. Sun Titan: a way to recur lost enchantments/aura/creatures/ect.